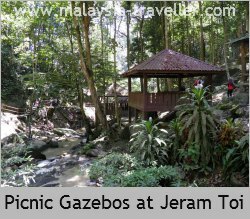 Jeram Toi is a popular place where young people and families like to swim in the natural pools and enjoy a picnic or BBQ next to refreshingly cool waterfalls amid a forest reserve area. 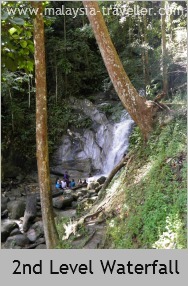 The waterfalls are easy to get to and do not require a long trek through the jungle, although there is a hiking trail if you want to. 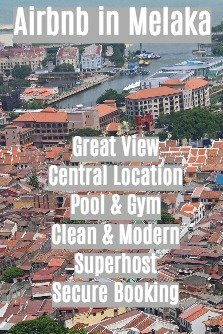 I visited recently (July 2012). After parking my car, I walked through the entrance gate (no entry fee) and next to the stream, past picnic gazebos until I reached the main bathing pool area. The water looked quite clean. There were a few water slides in the pool and they were in new, working condition (that makes a change!). I expected the park to be empty as it was a weekday but there was a large group of students frolicking and having fun in the cool water. 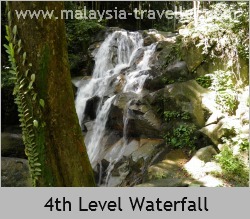 There are 4 main levels of waterfall. 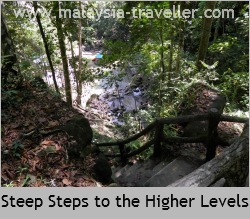 I took the path up a flight of steep concrete steps to the upper levels. 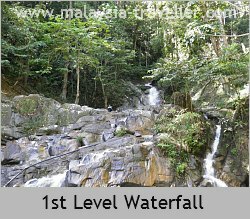 A group of students were taking a power shower underneath the 2nd level waterfall but there was nobody at the 3rd and 4th level falls. The trail peters out beyond the 4th level and the facilities that used to be here, such as the toilet block for the camping area, are now dilapidated and the area is overgrown. 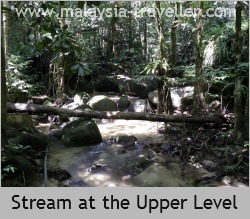 The stream has its source somewhere near the summit of Gunung Telapak Buruk and there is supposed to be a path to the summit from Jeram Toi. I suppose if I kept close to the stream I would not go far wrong but I could not find a clear walking trail. Anyway I had already been to Gunung Telapak Buruk by another route (see my story here) so I turned around and went back. A sign says that the park is open daily from 8am to 6pm. This might mean that the campsite is no longer operational. 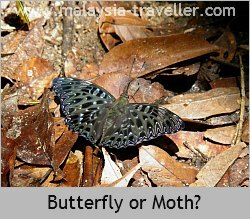 If you want to camp, better to check first with the District Forestry Office in Seremban (tel: 06-6014000). 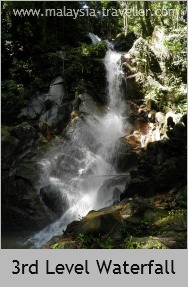 Admission to the waterfalls and pool is FREE! I have marked the exact location on my interactive map on the Top Negeri Sembilan Attractions page. If you are driving from KL I would suggest taking the new Lebuhraya Kajang Seremban E21 (LEKAS) as it is emptier and more scenic than the North-South Expressway. You also avoid having to drive through Seremban this way. Take Exit 2106 (Ampangan Interchange) and follow highway 86 towards Kuala Klawang (Jelebu). This road takes you past quaint villages near Pantai with their traditional Negeri Sembilan architecture before climbing up through the Lenggeng and Berembun Forest Reserves. 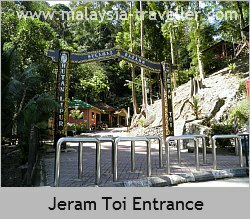 Jeram Toi is well signposted. 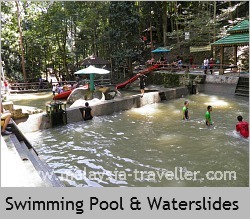 There are toilets, a car park, food stall and inflatable swimming accessory shop near the park entrance.